Basement sealing refers to the process of waterproofing your basement to prevent leakage, seepage, dampness, pooling or other breaches of your home's moisture barrier. While most homes have basement sealing performed during construction, over time the original sealant may break down and become insufficient for protecting your home from seeping or leaking water. Water that makes its way into your home can have seriously damaging effects. Beyond just soaking your belongings and making it impossible to store your things in the basement, water can be slowly absorbed into your home causing crumbling drywall, rotting joists, bloating or warping wood and more. Basement sealing ensures that your home is protected where it needs it most, that is, the part of it that's underground and exposed to moisture on a daily basis. While many people experience some leaking or dampness in their basements, it's certainly not something that you can just ignore. Water gets into your basement by being persistent. When your home was built, its foundation was placed in a big hole that was dug out for that purpose. Once the foundation, walls and basement sealing were completed, the loose soil was replaced to fill in the gaps between the hole that was dug and the new basement. The soil that was replaced, often called "back filled" soil, settles in much looser than it was originally, which means that it can hold more water. Through an osmosis-like process, the looser soil next to your home attracts water from the surrounding area, and before you know it, the lower part of your home is exposed to moisture on all sides. This process is normal to a degree, but persistent pressure from that waterlogged soil can eventually break down your basement sealing and allow some water to penetrate into your home. Excessive rain, snow or other precipitation can contribute to the problem, too, as can a steep or graded lawn or yard that causes runoff water to drain towards your house. There are plenty of reasons that water could be getting into your basement, and we're dedicated to locating the problem and getting it taken care of! What exactly is water damage? Water damage refers to the cumulative effects that moisture, dampness or pooling water have on your home. In addition to the obvious, that is, that water in your basement can destroy stored goods and ruin the usability of the room, moisture and dampness can have further far reaching and unexpected effects. Water in your basement increases the humidity of the air in your home, which means that porous substances like drywall and wood will begin to absorb moisture. This moisture absorption can cause swelling or warping in wood, bubbling and buckling in flooring, crumbling in drywall, and rotting in structural components like joists. In addition to the structural damage water causes, it also creates an environment that encourages mold, mildew and fungus spores to live and grow. These growths create an unpleasant musty smell as well as drastically decrease the air quality of your home. Mold, mildew and fungus can contribute to poor respiratory health, including adversely effecting asthma and causing respiratory tract infections. Proper basement sealing can prevent water damage and improve the value of your home. 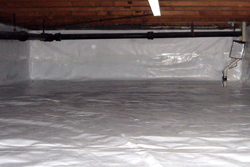 give you back a dry, usable basement and protect the value of your home. Give us a call today to find the source of your basement leak and put an end to the problem. Our basement sealing will protect the value of your home and your family's health for years to come!